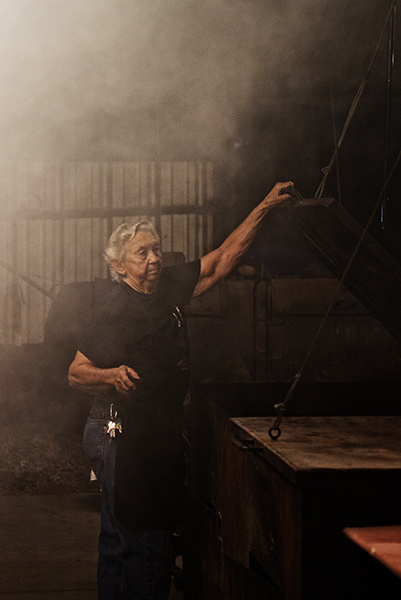 Whether she’s tending to the grounds at Giddings High School or keeping the fire going at Snow’s BBQ, Pitmaster Tootsie Tomanetz doesn’t have a lazy bone in her body. As Pitmaster Aaron Franklin tells it, the 81-year-old doesn’t see herself putting on the brakes anytime soon — slowing down just wouldn’t suit her. Tootsie has been a career pitmaster. She’s been at it for 50 years, and she’s done most of it outside the limelight. She did her share of the daily grind at her meat market in Lexington outside of town back when nobody noticed. I think it’s pretty cool that she’s famous now for doing it once a week at Snow’s. My back and my knees hurt every day, and I’m only 38. I have a nasty smoker’s cough, and I don’t smoke. She’s more than twice my age and she’s still working as hard as I do. That’s rough. I can’t imagine doing this at 61, let alone 81. I mean, think about the iconic names in Texas barbecue in her generation. Most of them have passed on or are retired. Take Rick Schmidt who is 10 years younger but retired from Kreuz Market in Lockhart a few years ago. Nothing seems to stop Tootsie. I want to be able to say I’ve accomplished as much as she has, but to her she hasn’t accomplished anything. She just works. That’s what Tootsie does, and that's what barbecue is. It’s just working folk. People get glorified and placed up on a pedestal, but they’re just hard-working people. Tootsie didn’t get into the business for the fame. She’s famous now, but that’s not her motivation. 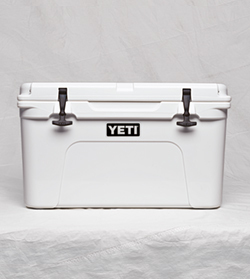 There’s barbecue to cook, and that’s what keeps her going into Snow’s every weekend. I remember first eating at Snow’s BBQ after I got a call from Katy Vine at Texas Monthly. She had just tried the brisket and told me I had to go out to Lexington. She said it was going to get crazy once word got out, so we went one Saturday morning. The brisket was great, then I had the pork steak. That is truly Tootsie’s secret weapon. At the time, I was already working on the trailer. My path was laid out, but we hadn’t opened yet. Long lines for barbecue were unheard of, so it was crazy to witness the lines form there when they were named best barbecue in the state. Snow’s paved the way for people to endure waiting in line for barbecue. And the way that barbecue has ended up being so urban, they’re keeping it real in rural Texas. There’s a sense of community there along with it being a true barbecue destination. Now it’s fun to go and just watch Tootsie work. She has an old-school work ethic, and an old-school way of cooking barbecue. She doesn’t use a new-fangled offset smoker (like I do). She’s a hold-out. She has no interest in cooking over anything but wood coals. That’s how she learned to cook barbecue in Giddings 50 years ago, and that’s how she still cooks it. When I grow up, I want to be like her. Barbecue cooks all over should be looking up to her and striving to be a fraction of how awesome she is. Tootsie has been a career pitmaster. She’s been at it for 50 years, and she’s done most of it outside the limelight.